Taminophile: Newsflash: Puccini's Shabby Little Shocker Not All That Shabby! Newsflash: Puccini's Shabby Little Shocker Not All That Shabby! 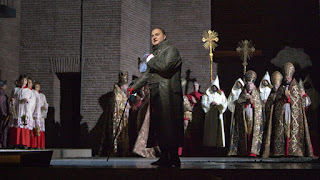 I was delighted beyond measure to see The Metropolitan Opera's new production of Tosca on January 12. Regular followers know that I am a great fan of the soprano Jennifer Rowley, and this was her one scheduled performance in this production. Why it was only one, I can't imagine, but I was delighted to see the recent announcement that dear Jen will sing Leonora all of the Met's scheduled performances of Il Trovatore, which opens January 22, taking over for the originally announced Leonora. Scarpia! Wow! Željko Lučić (I don't know how to pronounce it, either) was simply amazing. Enough vocal power to stop a Mack truck, enough stage presence to make one attend to his every move and gesture, and enough acting power to make one want him to die a thousand painful deaths instead of the one merciful death he is granted. Scarpia's big moments dramatically were also phenomenally beautiful vocally. How often can one say that? Remember I came of age during Cornell MacNeill's later days, when George London was still a fresh memory for my teachers and advisors. This man deserves comparison with those greats. I admire Vittorio Grigolo very much, but I won't say I would happily cast him as Cavaradossi. Quite often I find his voice light for the roles in which he is cast, and this is certainly the feeling here. Although there was never a feeling of "Oh dear--I wonder if he'll get the next bit! ", one simply lacked the feeling of "Ahhh! This is how Cavaradossi was meant to be sung." I was so conscious of this studied lack of discomfort that in the end I missed Mr. Grigolo's artistry, which is indeed considerable. Having said that, I can state his "Vittoria! Vittoria!" was glorious and his "O dolci mani" was sweet and tender. Quite frankly, Jennifer Rowley is the reason for this post, the reason I braved the Henry Hudson Parkway and actually went into Manhattan for the first time in months. And yes, that feeling of "Ahhh! This is how Tosca was meant to be sung!" was there in abundance! Vocal beauty, acting, commitment--a totally satisfying performance. One can see in her portrayal that Floria Tosca was actually a very young woman--jealous, insecure, impetuous, gullible. All eyes were on Miss Rowley whenever she took the stage. Her scenes with Scarpia were magic. 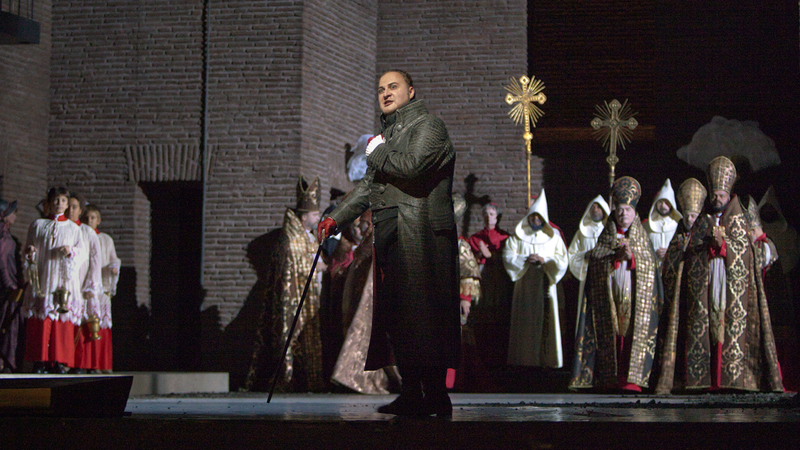 Tosca is built around conversations--Tosca and Cavarodossi, Tosca and Scarpia, even Cavaradossi and the Sacristan. This was where the entire cast shone. (The Sacristan of Patrick Carfizzi, Sciarrone of the handsome Christopher Job, and Angelotti of Christian Zaremba were very good indeed.) There were many fine dramatic touches in this new production by Sir David MacVicar, who is known for his recent Norma, as well as the three Donizetti Tudor queens at the Met (It's not a trilogy! Stop calling it that!). I've never seen Cavaradossi working with both an initial small-scale painting and the large-scale final painting of Mary Magdalene in Act I, and I also adored the moment in Act I after the Tosca-Scarpia confrontation when Scarpia grabs Tosca's stole and locks her in a gaze before she runs away in disgust and horrror. And Cavaradossi's trembling with terror in Act III, just before he is shot by the firing squad (sorry if that's a spoiler) shows that he knew from the first that the "mock execution" wouldn't be mock at all. Sets and costumes by John Macfarlane were stunning. 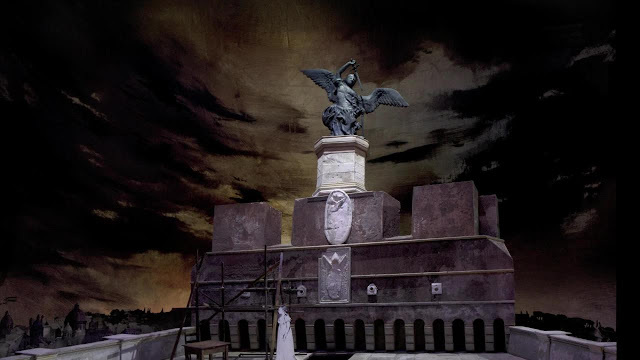 I especially liked Scarpia's apartment in Act II and the roof of Castel Sant'Angelo in Act III. The always amazing Metropolitan Opera Orchestra lived up to their reputation under the leadership of Emmanuel Villaume. It must be a great challenge having a rotating cast, but there were very few moments when pit and stage were not together, and the vast majority of those involved singers who are singing most of the performances in this run.